Dealing With Things. Because Things Will Happen…. Despite our best intentions there will always be things that happen. Things we don’t want to happen. Things we never think will happen. And things we think that should not happen to us. But it does. They do. How we survive in business is so much dependent upon the way that we deal with things that happen to us. I’ve heard this phrase used on occasion throughout my life’s journey. It’s an excellent mantra to live by. I always expect best outcome. And I am blinded by best outcome so much that everything that may prevent me from reaching my desired outcome is purely a blur. But I am not oblivious to the possibilities of events distracting me from my outcome. I am prepared for them. There are a lot of people who work their lives upside down and back to front compared to this. They become paralysed by the thought that something will go wrong, or could go wrong, despite the odds being so minimal, and as a result of this contemplation of the worst, they never ever take that step forward toward what they desire. And it may not be toward a lofty goal or target. It may only be toward something better. But the fear of something not going as it should can prevent people from taking any action at all. When things happen that divert you from your goal, take fresh aim. There will always be distractions and diversions. A true champion recognises these as inconsequential potholes along the freeway of life, and even when they occur, he refocuses on the original goal. He does this because he knows the value of what he wants to achieve. And he knows the journey is part of that accomplishment. Staying still and not doing anything is never the correct answer. But for some, the pain of inaction is more comfortable than the fear of actions not turning out as we would want. The Boy Scout motto was to always be prepared. And what a great motto that is. Not be oblivious. Or reckless. Have you ever noticed that justice seems to end up being done? Whenever there is focus upon a result, the little things, the distractions, seem to sort themselves out. It means we can get on with getting on with what we want to achieve. Sometimes, it’s not our job to make people feel good, as we go about our day-to-day duties. But it is our duty not to make people feel worse. And sometimes we can make them feel worse purely by accident. We can do this often by not considering what we say to people before we say it. And the easiest way to avoid accidentally making someone feel worse is to say nothing. But nothing is not an option. The next best thing to do to avoid accidentally making someone feel worse is to ask some clarifying questions. Gentle clarifying questions are great things to always use to check the lay of the land before we make an opinionated statement. It’s always wise, when asked your opinion on something, to find out as much as possible where the asker stands in terms of their own position, if possible, before hanging yourself out to dry, so to speak. If they answer yes, you can ask them what they thought about it. If they answer no, not yet, you can ask them if they plan to, and ask them why they might be interested in seeing that movie…. Or somebody mentions the weather. This allows us to work out where that person stands before digging ourselves unknowingly into a hole by rushing in with our own opinion firstly. When they answer with “No I don’t like it hot, I have recently had a melanoma removed”, it’s a lot easier to ask them how that has been for them. Mary will then let us know *exactly* why she feels the year has flown for her. We have avoided second guessing Mary. There may be a very good reason, a very personal reason, why Mary has begun this conversation. It is our duty, always, to draw out that true reason first and foremost as much as we can before we state our position. Similarly, a closed mouth gathers no feet. It’s very difficult to put your foot in your mouth if you’re not the one doing the talking. And that’s what we’re trying to avoid. We’re trying to avoid offering unasked for opinions ahead of time. It just makes life so much easier when you go seeking clarification first. And when you can do this, when you can master the art of gentle clarification, the other person will always feel that by virtue of the fact that you are asking them questions, that you are indeed an interesting person. The best way to appear interesting to someone is to be interested in them. Never a truer word has been spoken. Yet so many people try to. They try to do just that. They try to please everyone. Truth be told, there’ll always be someone unhappy with what you do or say. You see, I believe it’s your job, it’s your duty, to come up with the best outcome, with the best result, for you, first and foremost. To protect your own reputation…..
As a dentist, years ago, when I was beginning my life as a business-owning dentist, I needed to make some tough decisions. About the direction I wanted it to go. If I was to be truly happy in my work environment. I decided I needed to always be providing the best Dental Care I possibly could provide to all of my clients and customers. And in so doing that, I was going to offend or upset some. I was going to upset those customers who just wanted a quick fix. Those customers who just wanted me to “get them out of trouble”…. Because doing that for them was never going to be a solution. It was only going to be a temporary solution. A quick fix until next time. And who would know when that time would be? We’d only know that it would be, that it would happen…. Next time would always come along. And so nobody is ever happy in that situation. Least of all the patient….and…. What I learned was, that in providing the best option only for the patient, rather than what they thought they wanted, I put the onus of success right back on them. Because, before, when I compromised their treatment, and let them tell me what they wanted, no matter how long that compromised solution lasted, it was always going to fail and it was never ever ever going to last long enough. And living life like that, as a provider of healthcare, of health *CARE*, to me, that was no way to be living. I can just see the signs…. Somehow that slogan doesn’t cut it for me…. And today, as I coach and consult, it’s the same. There just has to be some tough decisions made. And that’s what a good coach does. A good coach helps you make the right decisions. A good coach helps you make the decisions that will give you the best outcomes. But the path to achieving those outcomes won’t be easy. But they will be worthwhile. When I did the firewalk in 1994, I didn’t know what I was doing. Nor did I know why. Because the firewalk is a metaphor for life and life’s decisions. It’s about focusing on the destination. It’s about focusing on the end result…. And not about the process. Every decision that we make must be about achieving the best outcomes. And in doing that, in achieving those outcomes, there will be people who will be unhappy with the decisions we’ve chosen and made. But the results of those decisions? The results of those choices? How’s Your Dental Knowledge? Do You Know It All Already? I’ve had reason to revisit my Special Report in detail. Not because I’d forgotten something in it. But rather, sadly, an email from someone dental came across my desk where the Subject Line was a *DIRECT STEAL* straight from my Special Report. In this case, a Line from Page 3. And this is not the first time that my material has been copied. I should be flattered that people out there need to quote my stuff without quoting me. But at the same time I’m disgusted at the feeling of violation. Anyway, interestingly, in these past few days I’ve been an active participant on two rather long but serious threads of debate and discussion on a couple of online Dental Chat Forums. And it’s been these discussions, and some of the responses from others, that have led me to revisit my Special Report. You see in online discussions, it’s very easy for a subject to be hijacked away from the original topic or question to be discussing something far less relevant. And the hijacking sometimes is done by people with very little or no authority or experience to do so, apart from a desire to see their name on a thread. There’s a whole wide world of experience way outside of the Hundred Acre Wood for those dentists who’d just take a step back and listen, or better still take a couple of steps forward outside of their comfort zones and look. In much the same way that Columbus just trusted, as he sailed off west into the sunset to disprove the flat earth theory. And we all know that the Horoscopes that some people look to today were designed in a day when it was believed that the Sun revolved around the Earth. And that’s the point that I was looking in my Special Report for. I was looking for the lines about not knowing what you don’t know. Because there’s a lot of that about. There’s a lot of people out there who are unaware that they don’t know what they don’t know. Sadly, they don’t know it. And that’s the feeling I get when I hear people say or I read people writing that they know that they’re delivering Great Customer Service…. Because, more often than not, what they’re giving is maybe only slightly better service than what they think they were giving. It’s one thing to say that you offer good customer service. But if you’ve not got a consistent system for delivering great service time in and time out, then you’re really not offering a World Class Experience for your patients at all. Because being nice, or being nicer, on an irregularly occasional basis, is neither here nor there. As I said in the Special Report, I don’t mean to be confrontational, but it’s the truth. Those who tell me they’re giving great service are often limited by what they know. Their frame of reference is off, because what they think is a good patient experience, and what’s really a good patient experience, are two, very very very different things. Ever tried to self diagnose an illness from Dr Google? You can be way way off, can’t you? And it’s the same with Customer Service. Your system of delivering customer Service to your patients needs to be so thorough, so complete, so water-tight that there are no cracks, no leaks and no gaps for patients to slip out through.. If your service is not predictable, reliable and systematic… then you’re really not offering a World Class patient experience. The good news out of all of this is that while ever there are Dental Offices out there that believe that what they’re doing for their patients is *enough*, when it comes to customer service, there’ll always be comparison between what is average, what is good, what is great and what is truly World Class. The beauty of offering World Class Service is that because it’s service, there’s little or no extra cost for the Dental Office. But the cost to the business of *NOT* providing World Class Service? The cost of lost patients, and lost opportunity? 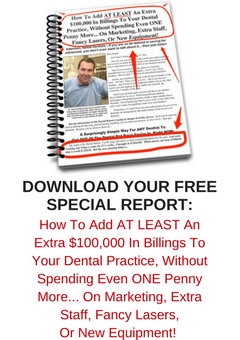 The Easiest Way And The Best Way To Manage Your Dental Office As A Viable Business. What’s the point indeed of being in the business of Dentistry? You see what happened was a Dentist got upset when the *FREE* at no cost to her package of my information arrived in her mailbox in an envelope that carried outside description of what was inside. She genuinely had a gripe that the material, in hindsight for her, might have been better being sent to a PO Box rather than her office, because it “advertised” to her staff and her postman a connection between dentists and money. And she felt awkward with that connection. And a lot of dentists do. And so the discussion then waxed and waned as to whether the postman read the packaging and took a dim view, and so on and so on. You see unfortunately, because of lack of education at University, Dentists are graduating with very little business and marketing knowledge. Four years ago I heard Omer Reed tell a group of Australian Dentists that at age 65, 95% of American Dentists will not be able to retire comfortably and support themselves…. And I’d politely suggest that that’s because 95% of Dentists choose not to gain any formal business advice or coaching. And that’s probably because of this unguided misconception and preconception that dentists graduate with that there *SHOULD NOT* be any relationship whatsoever between the performance of doing the dentistry and the financial benefits gained from performing that said dentistry. Because the anthisesis of this is greatly untrue. To think that somehow we will possibly arrive at the completion of our Dental career and magically all will be taken care of for our retirement without even *one single thought* about finance, money, income, bill paying and savings? Well that’s just downright fanciness! So where oh where do we then decide that some, yes some business planning is not only OK but also necessary, and how much, or what level of that planning is acceptable then? And who decides then at what point is some level of planning too much, and unacceptable? At what level of planning are we as dentists then “crossing the line”, or the imaginary line, from professionalism to commercialism? And why is that line, to some dentists, so bad at all? Why should there even exist a line or demarcation, in some people’s eyes? And who decides whether there is a demarcation? To put it bluntly, is this a self-imposed hurdle members of our profession are falsely erecting before us? Do the public really care? Again, to extrapolate to extremes, if dental offices were not run as commercial entities, at all, there’d be a *LOT MORE* foreclosures of more dental offices because of that lack of financial management. And who’d be worse off? Mr. and Mrs. Joe Public, for a start. Because there’d be less dental offices around for them to attend. And with the lower supply, there’d be opportunity for price rises…. and so on…. So I put to to you, Mr. Average and Worried Dentist, that you have an ethical and moral obligation to maintain a viable dental office just to make sure that the public has an available number of Dental Offices to choose from. Because if they don’t, you’ll be working a lot harder! So in a world without every Dental Office having a financial plan or a business plan, is it any wonder that such a large percentage of our noble profession reach the end of their careers with not much more than the shirt on their back…. And that’s the harsh reality? What’s the point of any life, of working all your life and getting to your retirement age and having to continue on working or having to downsize and live a greatly compromised existence? Yet somehow, somewhere in our professional upbringing of Dentistry as a Career, we’ve been led to believe that there’s something wrong with creating wealth and acquiring wealth as a reward for the performance of dental duties. Years ago, I was discussing with my coach, the question I get from patients from time to time about vacations and holidays. Because some dentists also get embarrassed about talking about their vacations with their patients. Nor should dentists get embarrassed about the type of car they own or the part of town where they live. Providing Dental Services in your office in an environment where the income and profitability of that office are assured and taken care of is a much nicer environment for both the doctors and for the patients and for the dental team as well. And that then has a flow on effect to attract more customers who prefer that sort of environment for their dentistry….